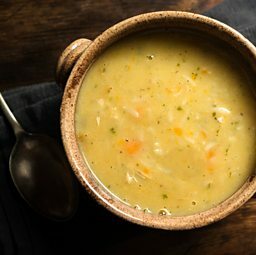 BBC Radio 4 - The Food Programme - Can comfort foods really make you feel better? Well, yes, they actually can. And the reason isn’t just psychological — although that is a more complicated statement than we used to think. The old medical model was based on the belief that body and mind are separate. Research has shown how wrong that is. I’ve lived abroad for long spells and when I’ve been feeling lonely and alienated by too much foreignness, I’ve often cooked my way out of it. At one low point, I made a proper Lancashire pork pie and it cheered me out of my bleakness. I’d recreated a key taste of home and my mood lifted. Dr Rupy Aujla, host of The Doctor’s Kitchen podcast, says comfort food provides a soothing effect on many levels. One is the placebo effect — if you think something is going to do you good, then it usually will. Research by Prof Ted Kaptchuck of Harvard Medical School has shown that the belief in the power of the treatment you’re taking — the pork pie in my case — triggers a complex neurobiological reaction that involves the release of feel-good neurotransmitters like endorphins and dopamine. They make you feel better. 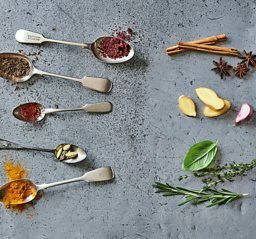 On another level, so many traditional comfort foods — soups, stews, omelettes, milk puddings — calm inflammation and nourish us. Chicken soup — Jewish penicillin as it’s often called — is a staple of different Jewish cuisines all over the world. The meat and bones provide collagen and protein, the onions and vegetables in soup have anti-inflammatory effects. They also feed the complex mix of microbes in the gut that turn out to be powerful in regulating our hormone system — and generally controlling how we feel. If you’d like to find some comfort in these dreary winter days, think back to what made you feel good as child. But if you want to try something new, here are five tried and tested dishes from the people we cooked with on The Food Programme. Fry the onions very slowly for 10 minutes on a low heat, add the garlic for another 5 minutes. Add the carrots and celery (chopped into 2cm pieces), fry for 5 minutes. Add the tomatoes, quartered. Add the thighs and carcasses and 2 litres of water (or more if necessary to cover all the ingredients). Bring to the boil and reduce the heat. Add the dill, salt and pepper. Simmer for 2 hours. Allow the soup to cool completely and remove any fat from the top with kitchen towel. Heat thoroughly before serving. Essential kit: 4 ramekins; a baking tin; a whisk and a fine sieve. Put the water in a small, heavy-based saucepan and scatter the sugar over it in an even layer. Let the sugar absorb the water for a few minutes, then place the pan on a medium heat and leave, without stirring, until the sugar has dissolved and formed a syrup. Simmer until the syrup turns into a rich brown caramel (there should be a light haze and it should smell wonderful). Wrap a cloth around your hand and immediately remove the pan from the heat. Pour the caramel into 4 ramekins, about 7.5cm (3in) in diameter and 5cm (2in) deep; tilt each ramekin slightly so the caramel coats the base evenly. Transfer the ramekins to a baking tin and set aside. Pre-heat the oven to 160°C/ 325°F/Gas Mark 3. Put the milk in a saucepan with the vanilla pod and seeds (or vanilla extract) and bring just to simmering point for 3-4 minutes to allow the milk to become infused with the vanilla. Meanwhile, in a large bowl, lightly whisk the eggs and egg yolks with the sugar. Slowly pour in the hot milk, whisking all the time. Strain the mixture through a fine sieve into the caramel-lined ramekins. Place the baking tin containing the ramekins in the oven and carefully pour enough boiling water into the tin to come two-thirds of the way up the side of the moulds. Bake for 55-60 minutes, until the crème caramels are just set (press gently with your finger to check). Any dip in the centre means they are undercooked. Remove from the oven and leave to cool, then chill for 2 hours (or overnight, if more convenient). 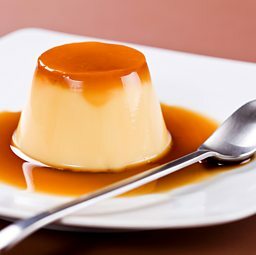 To release each crème caramel from the dish, take a thin, sharp knife and slide it around the inside edge of the ramekin, then turn it upside down on to a serving plate (or, more simply, serve them in their ramekins). In a large bowl, gently beat the eggs together using a fork with a pinch each of salt and pepper. In the omelette pan, heat the butter until it begins to foam. Pour in the egg mixture and cook undisturbed for a few seconds, allowing the omelette to set lightly before stirring the set part in towards the centre. Repeat this motion 4 or 5 times until the omelette has formed but is still soft and creamy in the centre. This way you will achieve the perfect texture. Scatter the pieces of salmon in the middle of the omelette and then fold the sides towards the centre. 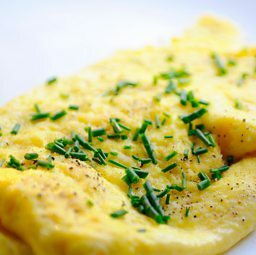 Turn the omelette out onto a warmed plate, brush with a little melted butter and sprinkle with snipped chives to serve. In his book The Doctor’s Kitchen, Rupy Aujla has a recipe for the ultimate Medicinal Broth. Serves 4. Melt the butter or coconut oil in a large pan over a medium heat, add the garlic, onion, ginger, star anise, turmeric, cloves and cardamom pods and sauté for about 1 minute, then add the chicken (if using), sweet potato or squash and cook for 3-4 minutes until browned. Pour in the stock, season with salt and pepper, add the chilli flakes and simmer for at least 20 minutes, until the chicken is cooked through and the vegetables are soft. Remove from the heat. You can cook for longer if you wish. Add the spring greens and red cabbage to the pan, stir and cover the pan for 2 minutes. Jill Archer is a loving but controlling matriarch in Radio 4’s The Archers. She's known for her ability to calm any situation with a home-baking solution. Her flapjacks are legendary and have huge emotional currency in the family. 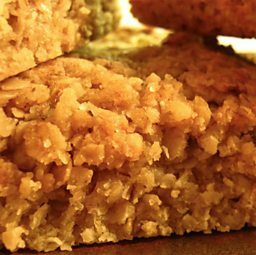 Here is the recipe for Jill's flapjack. Use it carefully! Preheat oven to 180C, grease and line baking tin of good depth. Combine the butter, golden syrup and sugar in a saucepan over a low heat. Keep stirring until the butter has melted and then take off the heat. Stir in the oats and lemon zest. Turn out mixture into prepared baking tin and flatten, pressing down firmly. Bake until the top is golden. Allow to cool a short while before cutting into bars. Allow to cool completely before removing from the tin. Store in an airtight container. Sheila Dillon shares some tips. How much do you know about cheese? How much do you really know about this Italian delight? These pairings may sound unusual, but they are delicious.